How to get Rohtang Pass Permit Online or using Mobile App in 2019? You are at:Home»India»Himachal Pradesh»Kullu - Manali - Mandi»How to get Rohtang Pass Permit Online or using Mobile App in 2019? 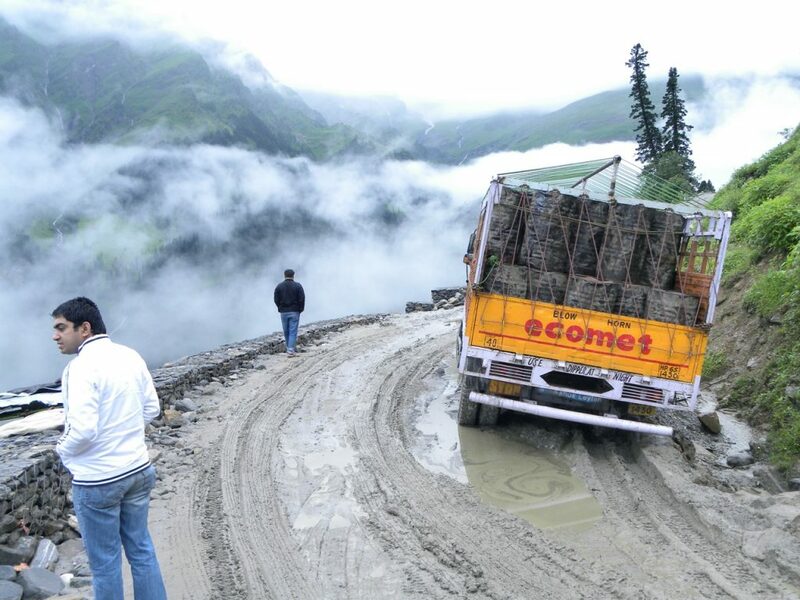 Ever since Rohtang Pass Permit has been introduced in 2011 for vehicles traveling in the direction from Manali to Rohtang La, there has been lots of questions and doubts flooding the travel forums and blogs over the Internet. Today, in this article, I will write a detailed step by step guide on how to apply for “Rohtang Pass Permit” and “Beyond Rohtang Pass Permit” online at official website of Kullu administration as well as using the recently launched Rohtang Pass Permit Mobile Apps by Kullu administration in 2018. How to apply for Rohtang Pass Permits? Is it possible to visit Rohtang Pass without permit? What if I travel very early morning or late night to cross Rohtang Pass? Can I get them in Manali in person? What will happen if I apply for beyond Rohtang Pass permit but come back from Rohtang only? In 2011, the permit restriction was enforced by NGT for any vehicles traveling on Manali to Rohtang Pass road in that very direction. No permit is required to travel from Keylong or Kaza side to Manali via Rohtang Pass. Ever since this permit was enforced, there has been so much confusion on the application of this permit and to add to the misery, rules changes almost every year. Every year we see new developments and changes to the rules of applying for these permits. One year tourists are banned completely to visit Rohtang, the other year they change the process of applying for the permit or they change the fee for the permit or some year they change the quota of allowed vehicles traveling to Rohtang, etc.. It was seriously miserable and required you to be up to date before making your travel plans to Ladakh and Spiti Valley regions. I believe all this hassle calls for one more reason to choose Srinagar Leh Highway over Manali Leh Highway when traveling to Leh Ladakh. The ecology of Rohtang Pass is getting destroyed with the huge number of vehicles going to Rohtang Pass in the season time and hence the step was required before the snow gets vanished from the Glacier. Along with the vehicles, the NGT tribunal has also banned horse-riding, snow-biking, paragliding and plying of snow scooters at Rohtang, Solang, and Marhi and also ordered the closure of eateries and kiosks. Commercial activities were already banned in this area by the NGT order. An eco-friendly market of 20 shops has been set up at Marhi to provide basic food needs to tourists. A series of events took place questioning the NGT order passed in February 2015 which restricted the number of vehicles going to Rohtang Pass to 1000 only and also posed hefty congestion charges too. From indefinite strikes to moving to supreme court to protests all over in Himachal, taxi union did all they cannot leave any stone unturned. However, the messages were strong and clear from the NGT to favor the ecology of Rohtang Pass which was getting destroyed by the pollution of vehicles over considering any kind of review petitions or hues or cries of the locals. Having said that, more or less in the last couple of years things have stabled for good. In 2015, this permit was made available online which solved many on ground issues and hassles for tourists struggling in Manali to get these permits. The rules for these permits are not changing much anymore. Kullu administration has further simplified out the process of applying for these permits by offering mobile apps for Rohtang Pass permit starting 2018. A few years back, NGT had enforced the permit for all vehicles visiting Rohtang from Manali side for tourism purposes and all vehicles require a permit to go beyond Rohtang Pass to Leh – Ladakh, and Lahaul – Spiti Valley. The permit has certain limitations on the number of vehicles it is issued while no restriction is applicable for vehicles going beyond Rohtang Pass. 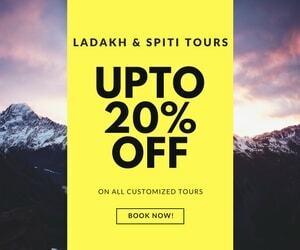 Hence, there are two categories of these permits, one just for visiting Rohtang and the other one is to go beyond Rohtang Pass to Leh – Ladakh or Lahaul – Spiti Valley. Nowadays in the tourist season time from June to September, about 25 electric buses ply on Manali to Rohtang Pass road. This certainly helps those tourists who cannot drive their own vehicles due to the restricted number of vehicles allowed by NGT on a per day basis. Hence, allowing them to visit Rohtang Pass without the need of the permit. There are about 14-15 HRTC buses available for Rohtang Pass in case one is interested to travel up there by booking tickets at HRTC Bus Stand at Manali. Vehicles are not allowed to go beyond Palchan without permits and in case you reach at Gulaba before 5.30 AM, you may get a challan. Please note, in case you could not get the permits online, you can always apply them at SDM office in Manali or Tourist Information Center. Tourist Information Center is open all seven days a week including Sundays and Holidays from 10 AM to 8 PM. Hence, Rohtang Pass permits are also available on Sunday as well. This helps 1000s of tourists who reach Manali on Saturday or Sunday morning but then used to wait for an extra day to get the permit on Monday to travel to Leh Ladakh or Spiti Valley. Tourists can apply online for the permit required to travel to Rohtang for tourism purposes as well as for the permit required to travel from Manali to Leh Ladakh or Manali to Lahaul – Spiti Valley. Given below is the detailed step by step process about how to apply for these permits using the online website of Kullu administration. Earlier Him-Aanchal Taxi Operators Union and Luxury Coach Association at Manali were managing the fixed daily quota of 325 diesel and 400 petrol vehicles. Permits for rest 75 diesel and 200 petrol vehicles were provided by the HP Tourism Department, which included permits for state transport and private buses as well. This type of permit is required only to travel to Rohtang Pass for tourism purposes. You can get the tourist permits of Rohtang Pass online from the link Apply permit for Tourism Purpose. This type of permit is issued to tourists for tourism purpose to visit Rohtang Pass only. This Permit is issued on a daily basis with a quota of 1200 permits in a day. The permit is issued as per the daily quota of 400 Diesel vehicles and 800 Petrol vehicles. This includes state transport buses, private cars, and taxis. The permits are issued twice in a day in two batches of 600. You can apply online for these permits in specific time frames twice in a day. These timings are 10:00 hrs (200 Diesel and 400 Petrol) and then 16:00 hrs (200 Diesel and 400 Petrol). In one week from Tuesday to Monday, only three permits are issued for a vehicle. Rohtang Pass permit is not issued for Tuesday as it is marked as the maintenance day. Hence, you cannot travel to Rohtang Pass for tourism purposes on Tuesdays. You can apply these permits for the next six days only from the current date. You need to pay a congestion fee along with the permit fee of Rs 500. Congestion fee vary based on the vehicle. The congestion fee is Rs 50 for a motorbike, passenger vehicle, and cars. The commercial vehicles need to pay Rs 100. Carrying a print out copy of the permit is mandatory. Vehicles with wrong information on permit slip than that of the original documents are not allowed to cross the Gulaba checkpost barrier. Hence, make sure that your vehicle information matches when applying online for tourist permits. This type of permit is required to travel beyond Rohtang towards Leh Ladakh or other parts of Lahaul, Pangi, and Spiti Valley. This type of permit is issued to tourists to travel beyond Rohtang Pass towards Leh Ladakh and Lahaul – Spiti region. This Permit is issued on a daily basis WITHOUT any quota. So, you will always get these permits. Please NOTE that a penalty will be imposed on defaulters who are visiting just Rohtang Pass and returning back from there on these permits to go beyond Rohtang Pass. You can apply online for these permits at any time of the day from 12.00 AM to 12.00 AM. There is no time window for paying the congestion fee. In one week from Tuesday to Monday, only two permits are issued for a vehicle. This type of permit is not issued for Tuesday as it is marked as the maintenance day. Hence, you cannot travel to Ladakh or Spiti beyond Rohtang Pass from Manali side on Tuesdays. You ONLY need to pay a congestion fee to travel beyond Rohtang Pass and no permit fee is charged. Congestion fee vary based on the vehicle. The congestion fee is Rs 50 for a motorbike, passenger vehicle, and cars. The commercial vehicles need to pay Rs 100. Carrying a print out copy of the congestion fee slip is mandatory. Vehicles with wrong information on congestion fee slip than that of the original documents are not allowed to cross the Gulaba checkpost barrier. Hence, make sure that your vehicle information matches when applying online for Beyond Rohtang Pass permits. Important: You must note that Beyond Rohtang Pass permit is required only for vehicles traveling in the direction from Manali to Rohtang Pass. Any vehicles coming from Leh to Manali or Keylong to Manali or Kaza to Manali DO NOT need any permit. Also, it was said that once you apply for the online Rohtang permits, it will be confirmed within a week and a tourist can show an SMS sent by the authorities at the Gulaba barrier. However, to date, I doubt this has been applied and there is some manual process in it. Beyond Rohtang Pass Permit 2018 Available Now !! Starting 2018-19 season, now tourists traveling to Rohtang can apply for both type of permits using the newly launched mobile apps by Kullu administration. The Rohtang Pass Permit mobile app is available on both Android Play Store as well as the iOS App Store. This is an extremely helpful step by the administration and it will help the tourists traveling to both Rohtang Pass as well as beyond Rohtang Pass in a long way. Here are the key highlights on how to apply for Rohtang Pass permits using a mobile app on your phone. Rohtang Pass permit mobile app is available for both Android and iOS devices/mobiles. You can check the validity of your permit on this mobile app by scanning the barcode on the permit or entering the permit number. You can check the status of the Rohtang Pass permit by entering the vehicle number and date of journey. 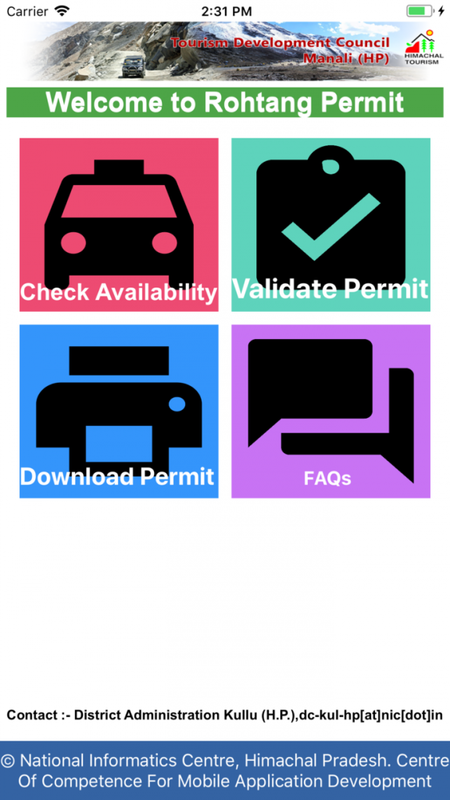 The permit is displayed on the mobile app and you can download the permit as a pdf to take the printout. People applying for the permit to travel just to Rohtang and not beyond it, they have an option to check the availability of the Rohtang Pass Permit in the mobile app. As there is a cap on the number of Diesel and Petrol vehicles to travel to Rohtang in a day, you can check if there is any permit available for the desired date of travel or not use the Rohtang Pass mobile app. The permit can only be applied between defined time windows (as mentioned above) and it cannot be applied in any other time window. Once the permit is issued, it cannot be canceled. Hence, please be careful in applying for these permit with correct dates and other vehicle details, so that you do not waste the permit for anyone else. There is an extreme scarcity of Rohtang Pass permit, so please be responsible towards other tourists as well. Please note that only two permits per mobile device or IP address is allowed in a week. So, if you are using the shared Internet like office or college or cyber cafe Internet, the possibility will be someone else would have applied for the permit and you will either see an error or quota full as the message. Hence, apply from a mobile or PC with an Internet connection that you think others won’t have used to apply for Rohtang permit. You can send in your queries at [email protected] for further doubts on the permit and issue with the mobile app or Kullu Administration website. Here are some of the screenshots of the Rohtang Pass permit mobile app. When you travel just to Rohtang Pass for tourism purposes then you need to pay both Permit fee as well as congestion charges. Hence, it comes out to be Rs 550 Motor Bike, Car & Jeep. In order to apply for the Rohtang permit, you need to provide a valid photo ID proof, Valid Pollution Under Check (PUC) Certificate of your vehicle and Vehicle Registration Date (Age of vehicle not to be more than 10 yrs). Please note that since 2017, a more mature technology based barrier system is set up at the checkpoints of Gulaba & Khoksar. Those of you who may not know, Gulaba is about 20 KMs from Manali and 31 KMs before Rohtang Pass. Khoksar is a small settlement on the northern side of Rohtang Pass in Lahaul Valley. The distance between Khoksar – Gramphu – Rohtang pass is about 19 KMs. Gramphu is about 4 KMs from Khoksar. It is the point where the road to Spiti valley bifurcates on right from Manali – Leh Highway. The new system will stop the misuse of the permits. It will ensure that in case you have applied the permit to go beyond Rohtang, the permit gets automatically verified at the Khoksar checkpoint. Data between the two checkpoints will be in sync to catch the misuse of the permits. Hence, if you applied permit to go beyond Rohtang and want to return from Rohtang only, then you will be caught at Gulaba checkpoint as there is no exit recorded at Khoksar for such a permit. Hence, you will have to apply the permit for Rohtang Pass only in such a case, capped to vehicle restrictions every day. Vehicles which will not comply with these guidelines and found misusing it will be blacklisted. Taxi union is working out to appeal that the barrier should be shifted to Marhi from Gulaba due to congestion at Gulaba while Marhi provides more space to park the vehicles. Some times there are time restrictions on traveling to Rohtang Pass. However, it depends on year to year. These timings restrictions for travel to Rohtang are mostly relaxed from July onward as the peak season ends in June and tourist rush in Manali town fades away. 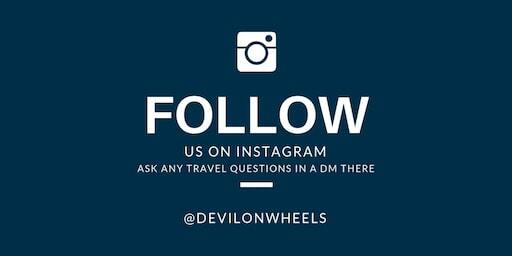 Let us look at some of the frequently asked questions on getting the Rohtang Pass permits. What documents are required for Rohtang Pass permits? You need to carry a valid vehicle registration certificate (RC of vehicle), valid pollution under control (PUC) certificate for the vehicle and you own valid photo ID card. Do I need any permit for traveling to Spiti Valley from Manali? Yes, you need to get Beyond Rohtang Pass permit and pay the congestion fee of Rs 50 for traveling from Manali to Kaza. Do I need any permit for traveling to Leh Ladakh from Manali? Yes, you need to get Beyond Rohtang Pass permit and pay the congestion fee of Rs 50 for traveling from Manali to Leh. Do I need any permit for traveling from Kaza to Manali? No, you do not need any Rohtang Pass permit is required for traveling from Spiti – Kaza to Manali. Do I need any permit for traveling from Leh Ladakh to Manali? No, you do not need any Rohtang Pass permit is required for traveling from Leh Ladakh to Manali. 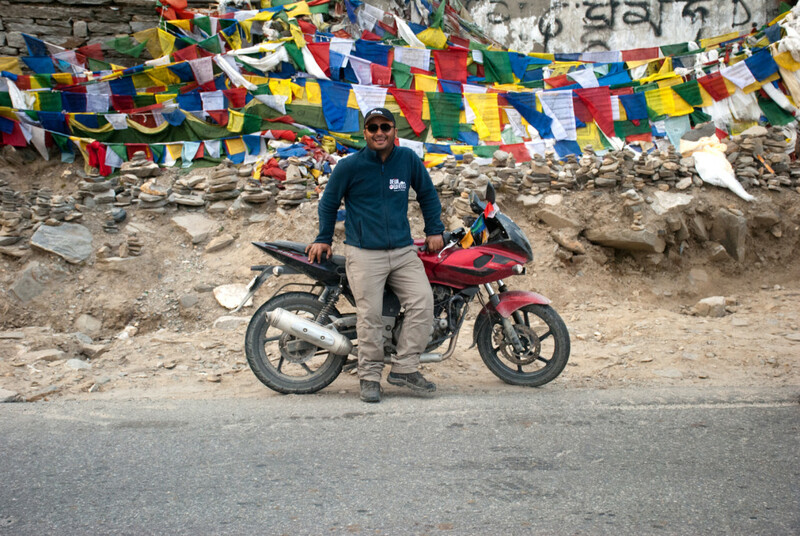 Do I need Rohtang Pass permits for bikes or motorcycles? Yes, both Rohtang Pass permit and Beyond Rohtang Pass permit congestion fee are required for bikes or motorcycles as well. Cycle does not need any permit. Can I get Rohtang Pass permit on Tuesday? No, you cannot travel from Manali to Rohtang or Manali to Leh Ladakh or Lahaul – Spiti Valley on Tuesday as permit is not issued on Tuesdays. Can I travel to Ladakh on a 10 year old car? Yes, you can travel to Ladakh on a 10 year old car but you will have to travel from Srinagar side and come back from Manali side because Rohtang Pass permit is not issued for vehicles more than 10 year old. How to visit Rohtang pass without permit? You can visit Rohtang Pass without permit by traveling in govt. run state transport buses or shared jeeps. Keep in mind that Rohtang Pass permit is issued for the vehicle not for the person. So, if you get the public transport, you do not need any permit to visit Rohtang Pass. Can I get Rohtang Pass permit on Sunday or Saturday in Manali? If you are not getting the permit online or using the mobile app then you can apply for Rohtang Pass permit in Manali at SDM Office or Tourist Information Center. Both of them offer permit services over weekends. However, best will be to apply the permit online or using mobile app. In the end, Rohtang Pass is one of the major attraction near Manali to be visited but there are many more places too in around Manali which are worth a visit. I am sure this article will help you with all your questions on Rohtang Pass permits and traveling beyond Rohtang. The Rohtang Pass Mobile app is a great and welcoming move by the Kullu administration and much appreciated. It is going to help so many people every year who are applying for Rohtang Pass permit. I am really thankful to them for easing out the process with this new Mobile app. In case, you have any questions or suggestions, feel free to post them either in the comments section of this article below. A big THANK YOU to Anupam Mahanta bhai for his continuous contribution in DoW Community Group on Facebook where he shared the above permit circular with all of us. No Vikram, Rohtang Pass is going to officially get closed by end of October. 1. Is it too ambitious? (time is really short for us). 2. Unless I physically reach Manali and fix up a vehicle, late in the evening of 21st, I do not know the vehicle reg number or the driver details. In that case, is there a way I can fix up a vehicle before reaching there? Or, is there a way the driver or we apply it in person for the next day, ie travel on 22nd? Apparently, the permit is issued from 12 midday to 12 midnight. 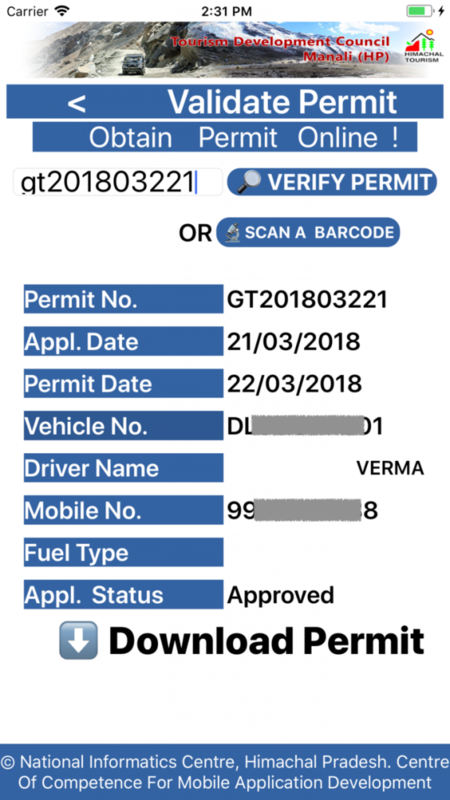 At 21.06 IST (from the app you suggested) 74/400 for diesel vehicles and 10/800 of petrol vehicle permits have been issued so far with no more under consideration apparently. Does that mean supply is way more than the demand at this time, or am I missing something here? 1. 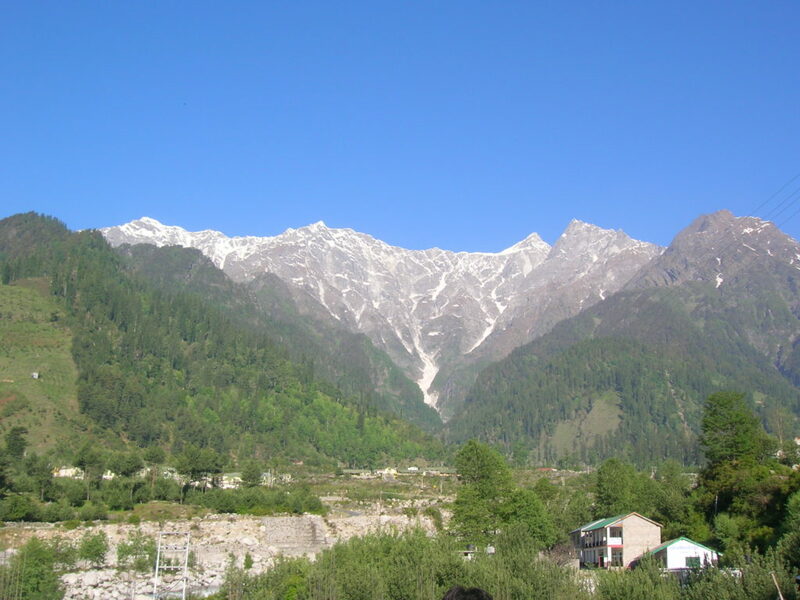 You can stay one night in Manali and Leave for Leh next day. You will have to stay overnight at Jispa or Keylong and then reach Leh on 23rd. Those permits are Rohtang Pass permit, you need Beyond Rohtang Pass permit to go beyond Rohtang Pass. I’m going to Leh via Manali on bike. I have obtained the beyond rohtang pass for 7th September. Do I need to get permit for Leh as well through Leh official website? Yes Sandeep, you have to apply the inner line permit in Ladakh to do sightseeing in Ladakh. Rohtang Pass permit will let you reach there. Checkout: How to get Ladakh Inner Line Permits Online? No permit is issued on Tuesday and I heard Rohtang pass is closed for tourist on this day. So if any vehicle coming from Leh side towards Rohtang pass, will he be allowed to reach upto Manali on Tuesday? 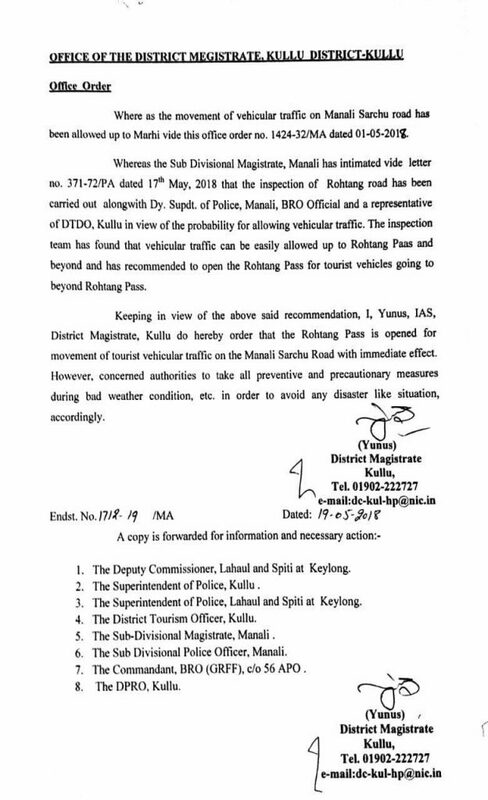 Yes, any vehicle coming from the other side of Rohtang Pass, that is from Leh side neither need any permit nor it will be stopped to reach Manali over Rohtang Pass. You will be able to make reach Manali from Leh even on Tuesday. Just wanted to check if permit is required for travel from leh to manali via rohtang pass? We are planning to visit leh ladakh via manali by our personal car in the first week of September approx date is 7th ,is it a right time to visit their & about road conditions. Today we applied for beyond rohtang pass.In first attempt it was failed.after that we were able to submit it.I have a query.At the bottom of rohtang pass there is space for sign to be signed by transport authority. Whether it matters for us?Where it will get signed? No Vipul, this will be signed by the checkpost folks, carry the print out with you. No Vipul, you will pass Rohtang Pass on 9th, you need only permit to cross Rohtang Pass. Then no need of any permit checking anywhere else. i want to visit at june 3rd or 4th…….so, now can i apply for permit. IF YES WILL IT BE POSSIBLE TO GET A ROHTANGH PERMITT AT THE SAME TIME FROM MANALI BECAUAE GETTING ONLINE PERMITT IS HAVING SOME ISSUE.. Yes, Raj, the roads to Ladakh are open and people are traveling every day. Even HRTC bus has started. You need to get Beyond Rohtang Pass permit for Rs 50 to travel to Leh from Manali side. Do not apply the other permit which says Rohtang Pass permit. Or directly go to gulaba bridge? Aman, you have taken the permit for 1st June, so you have to cross Gulaba on 1st June. You do not need to report anywhere in Manali, just take the print out of permit and submit at Gulaba checkpost. Called at Manali taxi union and they said they have not yet started plying private vehicles as the officials have not yet allowed tourists for Leh even in small vehicles as of today…Have you heard any updater on this ?